Indeed, a 2015 UNICEF study showed that MHM issues are still taboo, especially among youth. This not only leads to low awareness about menstrual hygiene among girls; it also means boys are apt to tease, or bully, girls about a process they don’t understand. Studies show such bullying of girls is widespread in Indonesia. One female participant, Eka Hardiyanti, says she remembers feeling afraid to go to school for fear of being ridiculed. “It was so uncomfortable for me to go to school during menstruation, since I was afraid my male peers would find out,” she said. Ilham and Eka are two of 20 participants of a two-day MHM training conducted by the women’s and children’s health NGO LemINA Foundation, in partnership with UNICEF. The training is part of UNICEF's efforts to promote the mainstreaming of MHM education at schools throughout the country. A failure to break the taboo silence can have significant impacts on girls’ education outcomes. One study found that one in six girls missed school during their last menstruation, many because they were afraid of being teased. The lack of knowledge around menstrual hygiene, meanwhile, can have repercussions for girls’ health. The training aimed to explain how to use a UNICEF-designed comic book to address this problem. The comic, titled "What is Menstruation?”, can help these educators introduce discussions around MHM in primary schools. The comic was adopted by the Ministry of Education and Culture and the Ministry of Health in mid-2017. In collaboration with the National School Health Program (UKS), it has been distributed to 340 elementary schools nationwide, and is expected to reach 34,000 5th and 6th grade students. The hope is that the book will raise awareness among boys about what menstruation is and, as a result, bring down bullying rates, empowering girls to pursue uninterrupted education. 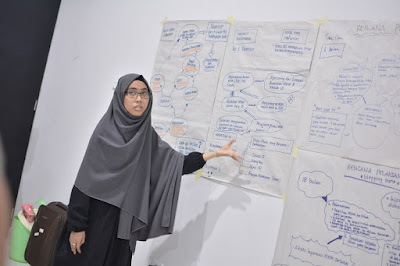 Nurfitriani Madjid, LemINA project manager, said the brainstorming sessions had equipped her and others with strategies that will help the project succeed. In particular, she said she learned one of the best ways to reach children was to relate to them as a friend would, rather than as a superior. Indeed, by the end of the training, most participants felt ready to jumpstart MHM conversations in classrooms to help stop bullying and positively impact girls’ education and health. “I hope the current generation doesn’t continue to view menstruation as taboo,” said Eka Hardiyanti. “No girl should be bullied like I was.